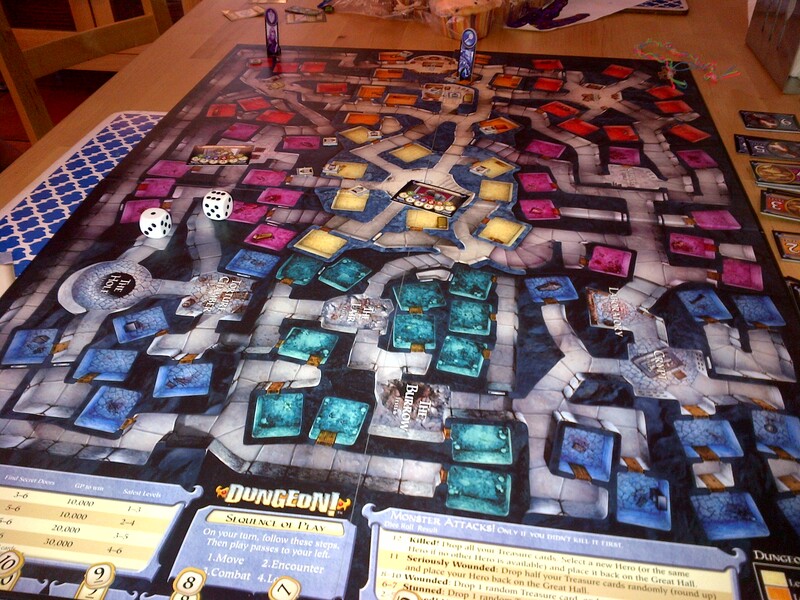 This weekend I had the opportunity to play Dungeon! with my daughter (7). We had a great time, and the rules were easy enough for her to quickly pick up and play. The game is simple, but very fun, and I definitely recommend it for parents looking for a D&D-ish game to play with their kids. It’s easy to learn, plays in less than an hour, and is engaging enough to hold their attention. The game, a WOTC reissue of a 1975 TSR board game designed by David Megarry, has a very simple premise: enter a dungeon, kill the monsters and take their stuff. Players pick between a Fighter, Wizard, Cleric or Rogue, and mover around the board entering rooms and looting the monsters. Each class has different victory conditions, so for example the fighter may need to leave the dungeon with 20,000 gp, while the cleric with only 10,000. The core mechanic is easy. Each player can move 5 spaces on their turn (spaces are represented by flagstones on the dungeon floor). Upon entering a room, they draw a card representing a monster appropriate for the dungeon level they are in. The card has the number that each class has to roll in order to defeat the monster via a 2d6 roll, so the player rolls, and if he hits, the monster is destroyed and they get to draw a treasure card. if they miss, the monster gets to attack them instead. The winner is the first to escape the dungeon after their victory condition is met. Easy, huh? I found that I enjoyed it a lot more than I thought I would, and what made it even better was that my kid had a great time and I didn’t need to keep explaining the rules to her. She got it right away. At only $20, the game is a steal. 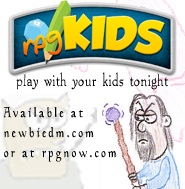 It’s priced right for a fun gaming session and I recommend it to parents looking for a good D&D to play with kids before they are ready for the real thing. You can help support newbiedm.com by checking out Dungeon! on Amazon. ← 2nd Edition D&D Coming Back, Old Modules Coming Back… What’s Next? We tried it a few times with friends. Very easy and enjoyable. If you put in some home rules (like pvp, some cleric abilities, dice rolling for move etc) it could be even better. I’m impressed, I have to say. Actually rarely do I encounter a blog that’s both educative and entertaining, and let me tell you, you’ve got hit the nail on the head. Your thought is excellent; the difficulty is one thing that not enough individuals are talking intelligently about. I am very glad that I stumbled across this in my seek for one thing regarding this. I kinda wish our beginning group had gone for this first…it sounds like a great and easy intro to the whole concept.